The genus Passiflora, commonly known as passion fruit, is prominent in the family Passifloraceae due to its numerous species (approximately 520) and economic importance. The biodiversity of this genus is widely represented in the Americas, where Colombia and Brazil harbor approximately 170 and 150 species of Passiflora, respectively. The economic interest in passion fruit species emerged due to the beauty of their flowers, their active medicinal properties, their essential oils that can be extracted for the cosmetics industry and their production of fruit for consumption or for obtaining derivatives. Brazil is considered the largest producer of passion fruit, although its national productivity is low (an average of 14 mt/ha/year) compared with the potential for passion fruit cultivation (50 mt/ha/year). This low productivity is partly caused by a lack of cultivars adapted to different production regions and their susceptibility to major diseases. Although the number of passion fruit breeding programs has increased, the results obtained thus far have been modest compared with existing demands. Such programs therefore represent a burgeoning field of research and financial investment. Among the obstacles faced by breeders, the low representation of Passiflora in germplasm banks (considering its species richness and wide geographical distribution) and the scarcity of biological and agronomic information for most accessions are the most salient. Despite the difficulties encountered in Passiflora research over the past two decades, there has been a notable increase in the use of molecular tools for the characterization of this genus and in the number of cultivars registered and effectively available for the large-scale production of passion fruit. 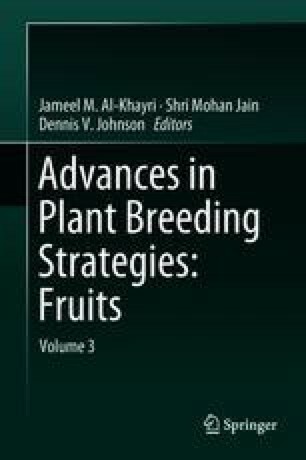 Thus, in this chapter, we present an overview of innovations and modern technologies, including advances in breeding programs and molecular tools, related to the availability of genetic resources for Passiflora. These technologies can be used as strategies to improve every stage of breeding programs, from pre- to post-breeding. Finally, we discuss future perspectives for studies leading to the genetic breeding of passion fruit (Passiflora spp.). The authors thank Empresa Brasileira de Pesquisa Agropecuaria (Embrapa), Universidade Estadual do Sudoeste da Bahia (UESB, campus Juvino Oliveira) and Universidade Estadual de Campinas (UNICAMP) for their support of this chapter; the authors also acknowledge Fundação de Amparo a Pesquisa de São Paulo (FAPESP 2008/52197-4), Fundação de Amparo a Pesquisa do Estado da Bahia (FAPESB DTE0001/2016 and FAPESB APP0005/2016) and Conselho Nacional para o Desenvolvimento Científico e Tecnológico (CNPq) for their financial support and fellowships. Universidade de São Paulo, Piracicaba, 13418900, São Paulo, Brazil. Brazil, especially in the State of Mato Grosso and in the Federal District.